Ticks are pests that we will have to live with, especially in North Carolina. Ticks are most active in the spring, summer, and fall. Some species are even active in the winter! Ticks are related to spiders and mites – they have eight legs. The tick goes through four stages of development and to complete each stage, the tick must take a blood meal. Usually each stage of tick development feeds on a different type of host. Ticks reside in leaf litter, foundation cracks, and other secluded places until they need a blood meal. They then move to tall grass or shrubs where the humidity is elevated before they attach themselves to the next source of a blood meal. The tick searches for a place on the skin to attach. Its mouthparts are barbed in order to aid with attachment (this also makes it difficult for removal!). Also, a glue-like substance is exuded to help the mouthparts stay put. Female ticks feed for up to 12 days and can increase in size by 100 times! Male ticks will also attach, but do not feed as long as females. The female tick mates while attached and can lay thousands of eggs after dislodging. Secluded places such as crevices and leaf litter are a favorite place for ticks to lay eggs. Eggs hatch in about two weeks and the life cycle starts over. There are four ticks that are found in North Carolina: the American dog tick, the brown dog tick, the lone star tick, and the black-legged tick (formally known as the deer tick). The American dog tick is the primary carrier for RMsf and possibly ehrlichioses. Rocky Mountain spotted fever (RMsf) is the most common tick disease in North Carolina. This tick is active in the spring, summer and fall. This species does not transmit Lyme disease. The lone star tick is thought to be the primary carrier of ehrlichioses. 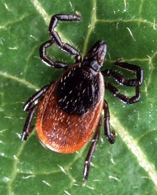 While adult lone star ticks are abundant in the spring and summer, their babies are hatched in the fall. These baby ticks (larvae) are commonly referred to as “seed ticks are commonly found in Lee County, and are abundant in the fall. After working in the yard, an unlucky victim may be covered with hundreds of these tiny parasites at one time. The black-legged tick is the primary carrier of Lyme disease. While Lyme disease is the least common in North Carolina it has received much media attention and is very common in the northeastern United States. Ehrlichioses is the least known but causes a severe illness, but is rarely fatal. RMsf can be fatal and Lyme disease patients can suffer greatly. All three are bacterial diseases and can be treated with antibiotics. It is important to catch them early. The symptoms for these diseases are similar. Contact your physician if you develop flu-like symptoms 2 to 21 days after a tick bite. Ticks can be targeted using conventional insecticide sprays. The best way to avoid ticks is to use repellents when working around the landscape. Take breaks to check for ticks. Wear bright clothing so it will be easier to spot a crawling tick. Wear long sleeves and pants, have socks pulled over pant legs to limit exposed skin to ticks (this is also a good idea to limit sun exposure).